Thanks very much, I received my order today. Very pleased to have discovered your service! 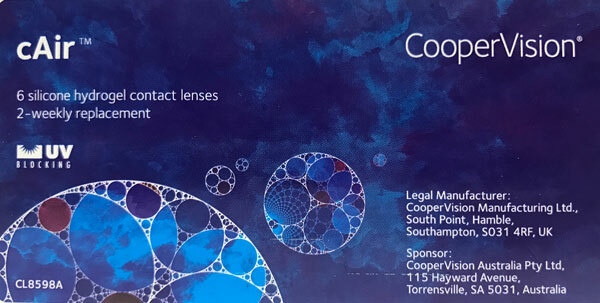 New cAir contact lenses by Coopervision are a new generation of silcon hydrogel lenses. Welcome to a new era of super-comfortable fortnightly lenses. cAir lenses are made from naturally wettable material and allow large amounts of oxygen to permeate the lenses. The edges of the lenses have also been engineered to smoother and rounder improving overall comfort when worn. cAir lenses also block more than 90% of UVA and UVB rays, ensuring you not only have clear vision, but your eyes are also protected from long term sun damage.